Als eines der meist genutzen Effekte in Audioproduktionen ist das Angebot an Hardware und Software Reverbs schier unendlich. Das Hauptmerkmal sollte stets ein natürlicher Sound sein, der sich perfekt im Mix integriert. Desweiteren sollte ein Reverb auch einfach zu bedienen sein, ohne den Nutzer mit zu vielen technischen Spielereien zu überschütten. FabFilter haben diese einfachen und grundlegenden Prinzipien verstanden und ein muskalisches Reverb Plug-in kreiert, das durch eine einfache Bedienung und natürlichen Klang besticht. Zu den Hauptfeatures zählen eine große Auswahl an Räumen, ein 6-Band Decay EQ sowie ein 6-Band Post Equalizer. Carefully developed to easily fit in the mix, without causing undesirable coloration, density or phase problems. Stepless Space control, which smartly and smoothly combines the room model and decay time of the reverb. You can choose from over a dozen carefully designed room models and seamlessly vary between them, without hearing clicks or unwanted artifacts. The Character control changes the sound from a clean, transparent decay, to a lively reverb with pronounced reflections and echoes, all the way to an over-modulated chorus-like effect. Perfectly tuned Brightness knob, affecting not only overall brightness, but also the decay of high frequencies. Mix knob with a Lock Mix option, which prevents preset loading from overriding the current mix setting. Predelay control via the bottom bar, ranging from 0 to 500 ms, with optional host tempo sync. Innovative six-band Decay Rate EQ, giving you full control over the decay rate at different frequencies. Six-band Post EQ to equalize the final reverb sound. Together with the Decay Rate EQ, this lets you design reverbs of any style or character. Multiple interface sizes: Medium, Large and Extra Large. Sample-accurate automation of all parameters. Extensive help file with interactive help hints. 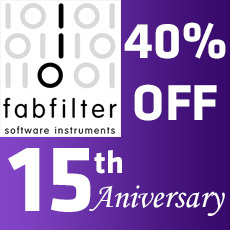 FabFilter Pro-R has an easy to use interface with a great sound. It is a very powerful algorithmic reverb but is light on the CPU.